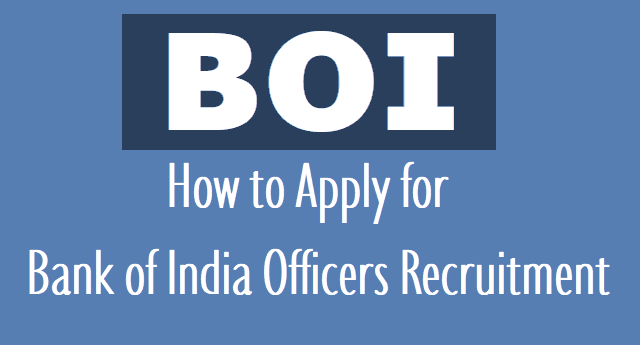 How to Apply for BOI Bank of India Officers Recruitment 2018: Bank of India has released official job advertisement for recruitment of officers. The Bank of India has invited applications for 158 officer posts (credit) in the general banking stream. The online applications start from April 20 on bankofindia.co.in. The deadline to apply online is May 5. Eligible candidates will be selected through an online examination which is scheduled for June 10 tentatively.The applicant’s minimum and maximum age as on April 1, 2018, should be 21 and 30 respectively. Candidates shall be selected through an online test and/or a personal interview. The online exam will be 3 hours long and have three components: English Language test, General Awareness with special reference to the banking industry and Financial Management. Aspiring candidates are advised to check the advertisement notification for more details.Steps on how to apply given below. Candidates are advised to read the instructions and guidelines in the Advertisement Notification carefully before applying. Degree in any discipline with minimum 60% marks along with MBA/ PGDBM/ PGDM/ PGBM/ PGDBA/ Post-graduation degree in Commerce/ Science/ Economics. Or Chartered Accountant/ ICWA/ Company Secretary. A certification in computer course for minimum three months or Information Technology or related paper as one of the subjects at graduation level or afterwards. Age: Age as on 01.04.2018: 21 to 30 years. Selection Procedure: Through online test, personal interview. How to apply: Candidates can apply only online from 20.04.2018 to 05.05.2018. Click on ‘Career’ tab from the top menu and then click on “Recruitment of Officers in General Banking Stream - Project No. 2018-19/1 Notice dated 01.04.2018”. This will open a new window. In this window click on “APPLY ONLINE.” The link is to be activated April 20 onwards. A new screen will appear. To register application, choose the tab “Click here for New Registration” and enter name, contact details and email-id. A provisional registration number and password will be generated by the system and displayed on the screen. Candidate should note it down. Fill and verify the details filled in the online application as no change will be possible after clicking the FINAL SUBMIT BUTTON. Candidates can proceed to upload Photo & Signature as per the specifications given in the Guidelines for Scanning and Upload of Photograph and Signature in the notification. Click on ‘Payment’ Tab and proceed for payment. The payment can be made by using only Master/ Visa Debit or Credit cards or Netbanking. Candidates are required to take a printout of the e-receipt and online application form.